For roll off dumpster rental Erie, choose Pro Waste Services. Locally owned and operated, Pro Waste Services will provide you with any size dumpster to fit your project requirements. From small house clean outs to large remodeling, roofing, and demolition jobs, we will serve all your dumpster rental needs. Therefore, there will never be a job too big or too small for our dumpster rental service. With reasonably priced roll off dumpster rentals, we can assure you that we have the right dumpster for your budget. Pro Waste Services is very knowledgeable and experienced. Carrying on family traditions in the local area with over 70 years in roll off dumpster rental Erie business. Whenever you need a roll off dumpster, think of the PROS: Professional, Reputable, Outstanding Service. When it comes to roll off dumpster rental in Erie PA, in addition to quality service, customer service is the main priority. Pro Waste Services has a solid reputation and great knowledge in serving customers. 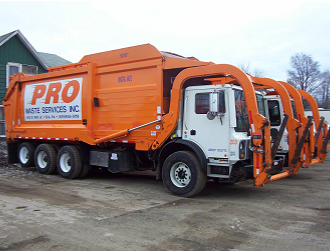 Most of all, Pro will provide you with the correct roll off dumpster rental Erie needs, but also take care of you as a customer. As a result to great service, our customers keep coming back and trust us. Not sure the size of roll off dumpster you need? Just leave that up to our educated staff, the PROS and we will get you the correct size dumpster for your project. Whether it is for residential or commercial use, we will take care of anyone. Serving the right roll off dumpsters, at the right price and with the best service around. Never hesitate to give us a call today at 814-455-5119 or contact us by going to our website and we will take care of you. In conclusion, we want our customers to experience the PRO Waste Level of roll off dumpster rental Erie service.